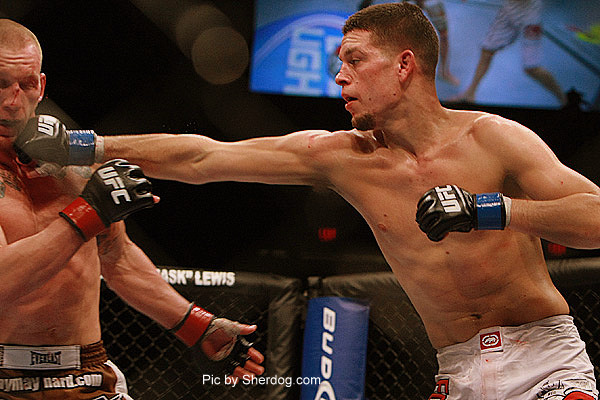 Nate Diaz (16-7) throws a high percentage of punches for one simple reason, he has no game plan. This is what has endeared him to fight fans across the entire sport of MMA along with his uncompromising and honest personality, also embodied by his brother Nick Diaz. Yet his fighting style is predictable, which will be his down fall against Benson Henderson (17-2) at UFC on FOX 5 on Dec 8th, from Key Arena in Seattle, WA. Diaz will succeed at putting pressure on the champ and yet will vicariously drop more points through fighting off his back with no regard for Bendo’s wrestling ability on the ground, or his wicked leg kicks while standing. Make no mistake, Henderson will utilize his Taekwondo background to frustrate Diaz with kicks and in the event Diaz attempts to pressure him with his patented punches in bunches, Bendo may opt for a take down or two to keep the fight from becoming a brawl. At this point there really isn’t much more to say about Diaz’s lack of chances in this fight. But may I point out one more troubling disadvantage he will face in the cage that night? He has yet to fight outside of the third round in his MMA career, of which Bendo has been doing for years as a challenger, then a champ, in the WEC and the UFC as well. Unless Diaz possesses a new found ability to knock his opponents out, he will find himself in deep water in the later rounds against a very tricky and versatile opponent in Bendo. No one really stands a chance in a UFC title fight without a solid wrestling game these days and though Diaz is not new to this aspect of the sport, he won’t be able to prepare for Bendo’s level of skill in this area enough to successfully sprawl his way out of five rounds. Fight of the night performances are made of stuff like this unfortunately. Diaz will fight to the bitter end but even though it might earn him more money, more fans, and unfortunately more hype, he can’t win unless he plans on catching Bendo in an early submission or beats him up enough in the early rounds to drain the champ. If people think Bendo isn’t prepared for Diaz’s boxing skills, then let me put it to you this way. Diaz isn’t ready for Frankie Edgar’s skills, and Bendo beat him twice! That’s if putting in perspective is possible for those who love the Diaz brothers. My largest complaint about MMA fans these days is their perpetuated irrational belief in the power of personalities. Sure Chael Sonnen, Brock Lesner, and Nick Diaz are great personalities in the sport and good fighters as well, but they don’t deserve the level of hype they receive as often as they do of late. In the world of modern Mixed Martial Arts, Sonnen was never going to beat Anderson Silva, Nick Diaz will never beat GSP or Condit, and Lesner didn’t even stick around long enough to earn the level of respect he is simply handed by many in the MMA community. What I’m trying to say is that Nate Diaz is a great fighter. Yet his fans need to realize that even though he deserves our respect, he isn’t void of scrutiny, and in this fight, he doesn’t stand a chance. Watch the trailer for Benson “Smooth” Henderson vs. Nate Diaz for the undisputed UFC Lightweight Title in the video below. VIDEO COURTESY OF TheAzyunyh5 AND CONTENT BY THE UFC.. Such a stupid analyze, you sir seem to have issues with the diaz bros. Who in the welterweight div is known for his extreme endurance… Nick diaz! guess who he trains with? Nate diaz.. so i dont see nate gassing before benson anytime soon and i will be quick to write you an email when diaz beats benson. Sigh.. Well I disagree but if I wind up being wrong I promise to to write an apology 🙂 I’m very confident it won’t come to that of course.